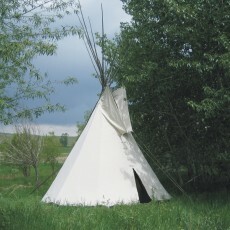 Standard Tipi Poles are completely peeled, high quality and ready to use. We sell Lodge Pole Pine tipi poles. Native Americans used these poles because they grew so tall and thin. 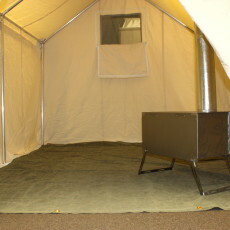 The poles you will receive come peeled and ready for immediate use. If you want them smooth to the touch, you can sand them down. If you want to preserve your tipi poles for a long time apply linseed oil to them. The oil prevents them from weathering and turning grey. It also turns your poles a nice brown color. If properly cared for you can get a good 15 years life out of your poles. 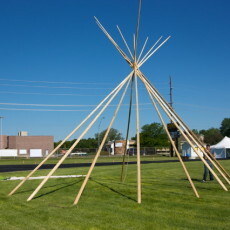 Please note: Tipi Poles have to be shipped via semi-truck. They vary in length from 12′-27′. Shipping averages between $370-570 depending on the location they are shipped to. We will contact you with the shipping price!! !